I think many of us have had the thought of quitting and throwing in the towel on homeschooling! I know I have and I'm not ashamed to admit it. Being a stay at home mom is the hardest job I have EVER had, add homeschooling on top of that and well it makes it even harder. 1) I lack the feeling of accomplishment and feel unappreciated. 2) The house is always a mess. 3) The kids misbehavior and constant fighting drives me crazy. 4) I'm failing to keep the kids up to "educational standards." Especially in reading and math. 5) I'm exhausted and feel like I am over extending myself many days. 6) I get very few days off. 7) Money is tight sometimes and another income would be nice. 8) Our bad days often out number our good ones. 9) The kids will not be prepared for college (should they wish to attend). 10) I yell at the kids way too much and fear it's hurting our relationship. But despite these thoughts and the bad days....I still wouldn't trade in being a stay at home/homeschooling mom for anything. We will persevere! These thoughts I have about quitting are just that, thoughts. We will homeschool through high school no matter what it takes! These thoughts are easily reversed by making simple adjustments, taking a day off and doing absolutely nothing, talking with my husband and close friends or by simply reminding myself the 10 reasons why we homeschool. Have you had thoughts of quitting? 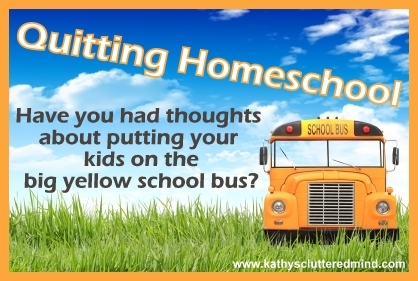 How do you get past the thoughts of sticking your kids on the big yellow school bus? Few... you had me worried for a second, friend. ; ) Persevering through the hard times is worth the reward at the end! I think we all have those days! Keep going, Mama - you're doing a great job! Kathy, my dear, you SHOULD quit! Not for good. Just for, like, a week. ;-) You can always, always get back to it when you've relieved some stress. I don't know if you school year round (have you said? ), but I don't. Even during the school year, if I feel the need to blow it off and get my house and attitude cleaned up, I QUIT. Definitely can understand how you feel. And my children are just little yet (6,5,3 and 1). I am so thankful I have a husband who supports my decision to homeschool. Though he was leery at first, he has seen how well the girls are doing (and he saw how much of a struggle my older children had in the local public school) and he will not let me quit, even though there are days I question whether it would be better to send them to school. Another thing that keeps me going is the girls' Words to Remember for the letter T in MFW K, "I don't quit, I persevere." How can I be trying to teach this to the children, if I don't follow it myself? BTDT! On the bad days, I need to remind myself that I am still far more committed to doing what is best for my kids than any teacher, no matter how great they or their school is. My kids are young too 7 and 6. Thanks for stopping by. We do kind of school year round. I have quit for month before right after we started homeschooling. Thanks for stopping by Cindy! I'm the opposite. After having my kids in public/private school for many years, I truly enjoy the freedom homeschooling gives my family. And on top of that, I work outside the home. Memories of the kids being in school for 8 hours then me trying to re-teach them everything they didn't learn in school for another 2 hrs makes homeschooling sound like Utopia. However, we do have hectic days and days I don't have the energy so what do we do? A field trip or take a school day off to be made up over the weekend. I did have 2 kids that really benefited from public/private school education, but every child is different. My younger 2 kids I hope to homeschool through high school.